The other morning, I was supposed to be writing. Instead, I just sat there, staring out the window and thinking about nougat. In fact, ever since I got a box of Toffifee for Christmas, I have been thinking a lot about German nougat and how I can incorporate more of it into my life. German nougat, by the way, is very different from French nougat. The Germans combine nuts and chocolate to form a magical substance they call nougat. The French, sadly, leave chocolate right out of the equation and still call it nougat. Even more sadly, Canadians hardly eat any kind of nougat at all. Then, as I sat there, I thought about how I was in the mood for something that is not a cookie and not a chocolate. I wanted something in between. Something small and chocolate-ish, but also cookie-ish. And I wanted it to have nougat. Suddenly, I was composing not a story but a cookie. Enter the marzipan left over from my stollen-making expedition in early December . . .
Add my desire to eat shortbread over the holiday . . .
Drop a few lines of melted dark chocolate left over from that disastrous truffle-making episode . 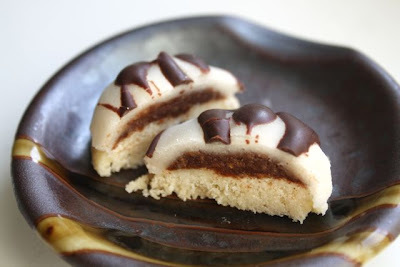 . .
And the chocolate-ish, cookie-ish thing is born: the nougat marzipan cookie. Make German nougat (which is not difficult) and dollop it on top. 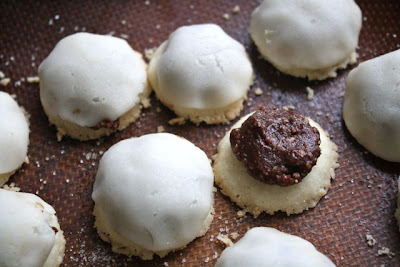 Pull out your extra marzipan and mold it into a patty to fit over top. 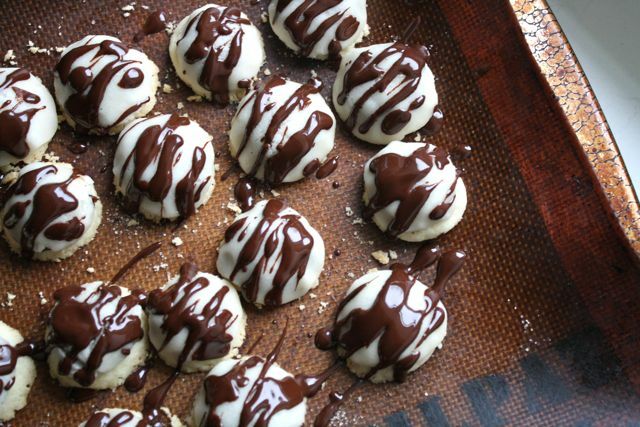 Melt some chocolate and start drizzling. A new little cookie for those times when you can't stop thinking about nougat and you want something that is in between a chocolate and a cookie. May you eat many cookies, chocolates, and everything in between. 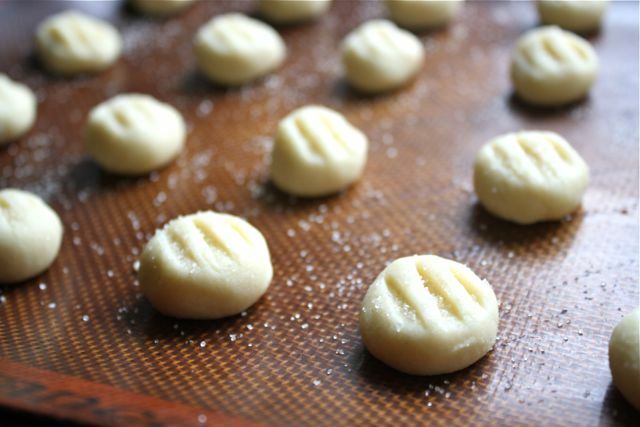 First, make the little shortbread bottoms. A half recipe from here works perfectly. While the shortbread is baking and cooling, make the nougat. Grind the nuts in a food processor until they look like couscous. Add the icing sugar and grind until fine, but not until you have nut butter. Empty into a medium-sized bowl. Add 2 teaspoons cocoa and stir well. Mix in the vanilla and coffee. If it is now a firm but spreadable texture, you're done with the nougat. If it's not thick enough, keep adding a bit more cocoa until it is. 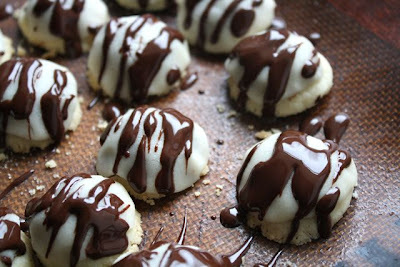 Once the shortbread is cool, spoon a bit of nougat on each cookie. Cut pieces of marzipan and roll them into balls. With your fingers, shape each ball into a patty. Carefully attach the patty to the cookie, over the nougat centre. When all the cookies have nougat and marzipan, start melting your chocolate in the top of a double boiler or in a metal bowl suspended over simmering water. 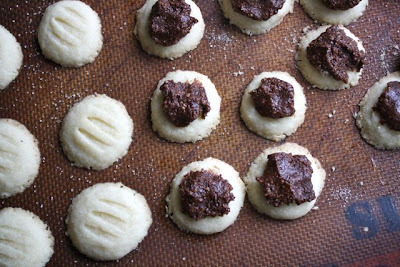 Once it's melted, use a small spoon to drizzle chocolate over each cookie. Refrigerate until chocolate has hardened. Eat! such a beautiful site. Found you through mama here now blog. will return!